Just put a new system online but MilkyWay tasks are all erroring out. Event log says each task has unrecoverable error. Task runs for 1 second and then moves to the next. I have all the required CUDA and OpenCL drivers installed. Event log shows no problems with the drivers. This is the stderr.txt output. Both SETI and Einstein are running fine on this new system. Message 67484 - Posted: 18 May 2018, 3:33:36 UTC - in response to Message 67481. Your line "stream sigma 0.0 is invalid" seems to be the first real error. Comparing your system with mine the stderr is the same but I show "Using SSE4.1 path" where you have that invalid warning. Googlein that error message did not get a single hit, sorry, not sure the problem. I assume it is related to opencl as the next line after "Using SSE4.1 path" is the platorm that opencl finds. However, you are running a really old build of boinc. My apt-get got me 7.8.3 and you show 7.4.44 really old. I assume that is not a problem since Einstein and seti are working. The official boinc download site shows an even older 7.4.22 but they make it clear that one should use the package manager to get the newest version. May not help, but you might consider getting 7.8.3. Message 67490 - Posted: 18 May 2018, 20:14:17 UTC - in response to Message 67484. Thanks for the reply. I guess I will have to delete the project from that computer or just put it to indefinite suspend till it gets sorted out by the project. I am running a specially compiled version of BOINC made for SETI users. It does not have the current 1000 task restriction on the number of tasks allowed like any BOINC version > 7.02. I will not update it to anything later as that would defeat my SETI usage which is my primary project. Strange, that is does not find the SSE4.1 path. In fact the SETI SSE4.1 cpu app is the preferred app on Ryzen and Linux. I have been running it for a year on all my Linux machines since it is much faster than AVX. Message 67494 - Posted: 19 May 2018, 11:04:49 UTC - in response to Message 67490. Load a separate instance of Boinc just for MW then. Message 67497 - Posted: 19 May 2018, 15:58:05 UTC - in response to Message 67481.
this may not apply to you, but I just discovered that one of my Linux systems "lost" opencl. This was a minimum server install and I mistakenly allowed it to apply updates and upgrades on its own when first set up several months ago. It seems to have rebooted just recently, possibly power spike, but I noticed yesterday that all asteroids, collatz and Einstein were erroring out. Collatz had almost 300 failed units. Unaccountably, I could not reinstall my original cuda 384 and had to download and install the 390.59 which also failed but at least the error messages showed up on google and I was able to install and get opencl working again. Message 67498 - Posted: 19 May 2018, 16:54:59 UTC - in response to Message 67497. Einstein and Seti OpenCL tasks continue to run with no issues so the OpenCL drivers are still working for those applications. BOINC still shows the OpenCL driver in the Event Log startup. @Mikey I've not ever tried to run another BOINC instance. I think you have to make a completely different data structure. All the posts I have read have been Windows centric. Well, I just tried resetting the project for S&G's to see if that made any difference. Got another batch of tasks and set NNT to limit the damage if any. No difference, all downloaded tasks immediately errored out till all were gone. I did see one interesting line in the Event Log after each upload and report. Sat 19 May 2018 01:21:07 PM PDT | Milkyway@Home | [sched_op] Reason: 3 consecutive failures fetching scheduler list. It fetched the master file successfully after the reset. It had no issues reporting each failed task and getting an ack. Don't know if that error has anything to do with the execution failures. Still getting the CL build failure in the new tasks. The stderr.txt all have the same failure as my last post. Message 67510 - Posted: 20 May 2018, 0:29:45 UTC - in response to Message 67505. Message 67513 - Posted: 20 May 2018, 0:55:31 UTC - in response to Message 67510. Message 67517 - Posted: 20 May 2018, 14:57:03 UTC - in response to Message 67510. Well now I have errored out 80 or so tasks on my Windows 7 machine using BOINC 7.8.3. So it appears not related to a too old version of BOINC. Just trashed another 50 or so tasks on BOINC 7.8.3 under Windows7 64 bit. Not a Linux or too old BOINC version issue. Message 67522 - Posted: 20 May 2018, 22:04:25 UTC - in response to Message 67519. Strange it sees only 2 opencl but tries the 3rd one anyway. Message 67523 - Posted: 20 May 2018, 23:52:56 UTC - in response to Message 67522. I don't know why it was only seeing two cards when the Manager always showed all three in use. SIV also showed all 3 in use. If a card drops out I usually will see it disappear from SIV which is always up on the desktop. I also would see its utilization drop to nothing. I just rebooted for S&G and will see if MW will run on all cards again. All the cards were in use all along for both SETI and Einstein. Only MW was having issues. MW is just being obnoxious for me lately. I think it will be only running on my Win10 box in the short future as I will convert this daily driver tomorrow to Linux. Message 67524 - Posted: 21 May 2018, 1:27:51 UTC - in response to Message 67517. Message 67525 - Posted: 21 May 2018, 5:09:48 UTC - in response to Message 67523. You are using CUDA 9.1.84 which came out last year. However, your video driver is 391.24 which is fairly recent, March 18 it seems. Something is not right. My windows 7 system shows 9.1.104 for CUDA and the driver that it came with is 388.71 which is older than your driver. Message 67526 - Posted: 21 May 2018, 7:27:43 UTC - in response to Message 67524. Hi Al, yes I just converted my first Windows 7 machine to Ubuntu 18.04 LTS and the kernel that came with it is 4.15.0-20 and is supposed to have most of the Ryzen fixes baked in. I will convert my second Windows 7 machine this next outage Tuesday. One of the benefits of the BOINC 7.4.44 that one of the BOINC Linux and MAC developers built is that it doesn't come from the repository and doesn't install BOINC in two different places with permissions that prevent changing any files or deciding where to put it. You just drop it into a folder in your /Home directory and the user group assigned to it is Me. I can edit any file I want to. It also raises the task limit to 3000 onboard a host and that has come in handy for maintenance Tuesday outages where our special CUDA app can process a cache of 400 gpu tasks in an hour. Later BOINC versions have a 1000 task limit and would only last about 20 minutes till you were out of work. That is one of the reasons I don't want to move to a later version. I could test the BOINC 7.8.3 Linux version that our developer made to see if the problem is solved. I would expect that is the case since that version is later than the 7.6 versions you say fixed the issue. But is has the 1000 tasks limit. 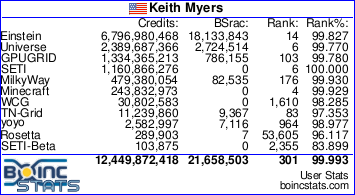 I am going to PM the BOINC developer of the 7.4.44 version just to give him a head's up. I doubt that he will do anything about it. I asked him for a modified version of his 7.8.3 with the raised limit and he said I could compile that myself since the one line of code that sets the limit is easy to find. That is the compilation project I mentioned that was a failure for me. The interface of 7.4.44 is fine and 7.8.3 interface doesn't really offer anything of substance so I find 7.4.44 fine and easy to work with. So it looks like I will drop MW from the Linux machines. I already did so on the new machine that exposed the problem. I have added GPUGrid as its substitute. Will do the same for the next machine. Message 67527 - Posted: 21 May 2018, 7:36:39 UTC - in response to Message 67525. I don't game so there is never any reason to constantly update video drivers for compute. Plenty of people running older drivers with no issues as long as the driver supports the hardware. No, not running any CUDA toolkit. Just the normal package downloaded from Nvidia. I assume that the card that kept getting assigned a MW task had issue with MW for some reason. It ran both SETI and Einstein with no issues. Moot point. I have errored out all tasks and set NNT. I then just removed the project. Will do the same for the next computer conversion, only about 200 or so tasks left on that machine now, and will finish and report them after setting NNT. I will then remove the project and convert to Linux.